 Or at least    the place where They come to drink coffee and design the actual best place on Earth on their laptops. 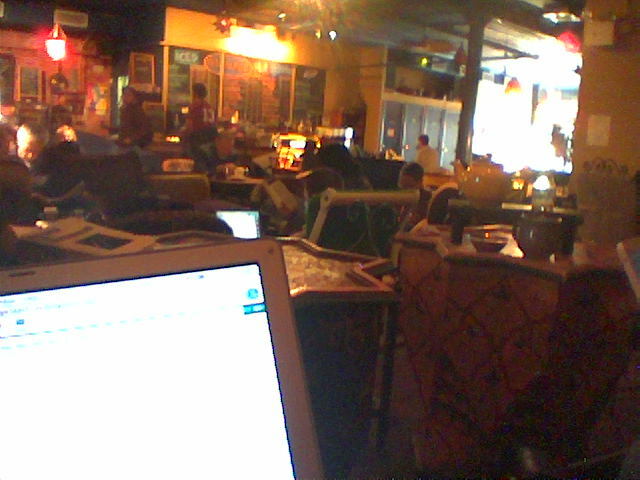 Using the FREE WIRELESS INTERNET and sitting the abundant comfortable seating and listening to really loud Miles Davis or The Postal Service on the stereo and eating good, cheap food. Oh, but fuckballs, this place is in Brooklyn. New York. Oh, and did I mention they have a FULL BAR. Yeah. A full bar. With booze. A bar. For the drinking. And... and you're going to think now I'm just lying... videogames. Joust and Ms. Pac Man. I know! Anyway... back to work. In heaven.